It doesn't seem that long ago that I last photographed Wheal Coates tin mine on the coast of Cornwall. When I looked in my Lightroom catalogue to find my last photograph from Wheal Coates I was shocked to see that it had been nearly two years to the day since I had last visited this great Cornish coastal location. Where does all the time go? It's not as if I had forgotten about it. There's a pin for it on my custom Google map but for some reason, I just haven't been back. It was time to go back that was for sure. If you read my blog on a regular basis you may remember reading my recent post on Dartmoor. In that post, I tell you why I headed up onto the moor when the weather forecast said I should really be at home. My most recent visit to Wheal Coates was in a similar situation. Any sane photographer wouldn't have even considered the 4-hour round trip if they'd looked at the weather forecast. But there was a small gap in the clouds predicated and given that I had the evening free, I thought it was worth a punt. As I drove along the A30 from Devon to Cornwall, I really started to question if I had done the right thing. Unlike my trip to Dartmoor the previous week which only involved a small drive, the drive to Wheal Coates was significantly longer. The further I drove into Cornwall the worst the weather got. At one point my windscreen wipers were on full and I was driving through a low-level cloud. However, I was still clinging onto that predicated break in the cloud. It is well known that you can get some amazing light from cloud breaks after a storm passes by, so I just kept thinking about how pleased I would be with myself if I got a really nice shot. As I pulled into the National Trust car park for Wheal Coates I looked out to the sea where I could see broken cloud, bits of blue sky and even the sun. I though that maybe this could turn out to be an amazing evening of photography. As I wandered down from the car park and onto the slopes, I was pleased to see that there was still a lot of heather about. Unfortunately, I was probably about two weeks too late to get it at its best, but it was still a wonderful sight to see. You would, of course, think that with so much heather on the slopes that picking a composition is easy. It can however be a little more tricky than just sticking your tripod on the ground and snapping away. The slopes are a complex mesh of paths, gorse, heather and unsightly dead vegetation. So it's worth taking a little time to wander about and finding a nice clump of heather that also doesn't have too many unwanted distractions around it. A Splash of Colour on a Grey Day at Wheal Coates #2, Cornwall - Nikon D850, Nikkor 16-35 mm f/4 at 26 mm, 3 seconds at ISO 64, f/13, Lee Filters Circular Polariser and ND Grad. As you see in the image above I had already lost much of the light and clear sky. The cloud appeared very quickly and anyone who photographs Cornwall a lot will tell you that even in the summer the weather can change rapidly. While I would have loved some light from the setting sun on the slopes I decided that I would #EmbraceTheGrey and make the most of the moody skies. For the next shot, I headed a little further down the slopes and closer to one of the old mine buildings. A Splash of Colour on a Grey Day at Wheal Coates #1, Cornwall - Nikon D850, Nikkor 16-35 mm f/4 at 20 mm, 2 seconds at ISO 64, f/13, Lee Filters Circular Polariser and ND Grad. As I looked back out to sea all I could see was cloud and the light was fading fast. I decided that I'd probably had the best of the conditions and it was time to head home, happy that I'd managed to capture a couple of images. I mentioned in my post from Godrevy a few weeks back that I was producing a video on photographing Cornwall for my YouTube channel. I'm pleased to say that I also did some filming for that video on my visit to Wheal Coates. So be sure to say tuned to the blog and make sure you are subscribed to my YouTube channel. I do hope you enjoyed this blog. Which of the two images was your favourite? 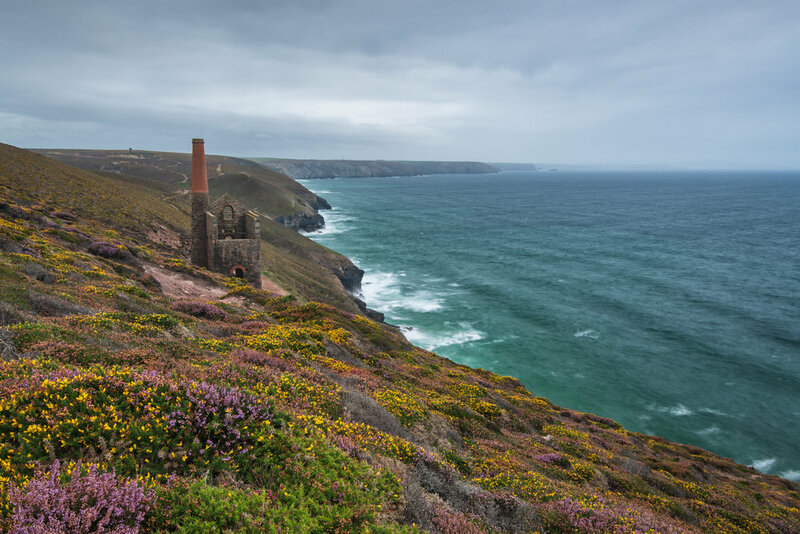 Have you photographed Wheal Coates before? Let me know in the comments below.